Leaf-shaped stone heads found in archaeological sites, as well as large points of bone and shell, give clear evidence that spears have long been used throughout North American both for hunting and warfare. The Piegan Indians of Alberta actually used spears in warfare until the 1860's. Soon however, the need to effectively strike at a distance to reduce personal danger led to the development of another weapon; the atlatl - the Aztec word for spear-thrower. This weapon of ancient origin was widely used not only in prehistoric Europe, but also in Australia, Africa, Central and Northern Americas. 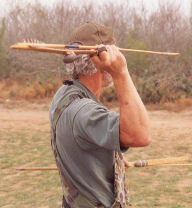 Although the atlatl was an effective weapon in skilled hands, it has some limitations and was gradually replaced by the bow. The bow and arrows became the most natural weapon imaginable for the Plains Indian Warrior. It was the first childhood plaything of which he had recollection. Proud fathers placed a miniature bow and a few blunted arrows in their son's hands before they were four years old, and from then on, they practiced constantly until shooting with them became an instinctive part of their nature. Although the introduction of the bow is quite recent in the Americas, by the time the first white man arrived it was widely used by natives on both continents. 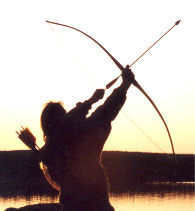 The most common type of bow was the simple wood bow or self-bow which was made of a single piece of wood. Osage also called "Bois d'Arc" and yew where the best bow woods. But North American Indians used a large variety of other woods such as ash which was one of the most popular bow woods on the Plains. They also used hickory, elm, maple, black locust, oak, birch and sometimes even saplings. Besides the plain self wood bow, native bowyers built rawhide and sinew lined bows. These bows were often shorter but also stronger and powerful .